If you’re looking for the perfect person to hit up for your daughter’s Girl Scout cookies sale, or you need an angel investor for your genius new pet spaw (geddit?) 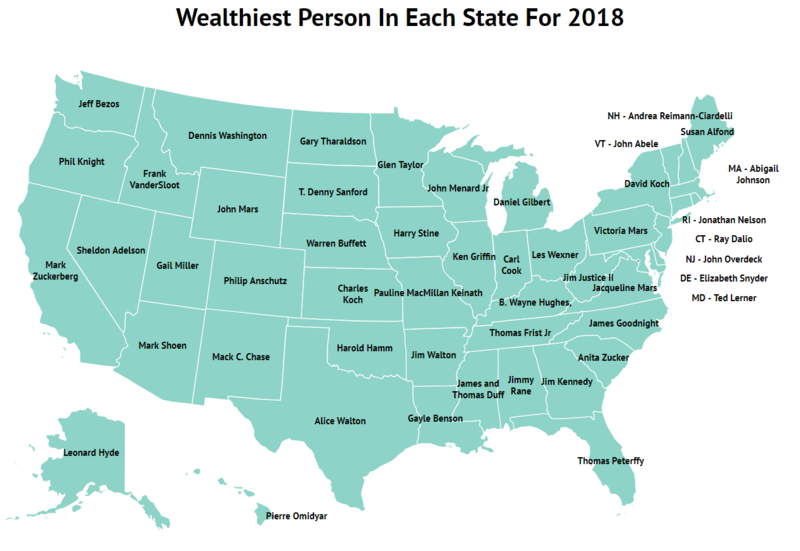 idea, check out Zippia’s new list of the wealthiest person in each state. The West Coast is easy. Amazon’s Jeff Bezos is the wealthiest person in Washington, Nike’s Phil Knight gets the title in Oregon, and Facebook’s Mark Zuckerberg tops the list in California. Berkshire Hathaway’s Warren Buffett keeps his title of the Oracle of Omaha in Nebraska. A lot of money is all in the family. The Walmart family fortune put Alice Walton and Jim Walton at the top of the list in Texas and Arkansas, respectively, while the Koch Brothers, owners of Koch Industries, the second largest privately owned company in the U.S., also keep it in the family, with David the No. 1 seed in New York and Charles at the top in Kansas. Billionaire business-owning brothers James and Thomas Duff share the top billing in Mississippi, and grandmother and granddaughter candy bar heirs Jacqueline and Victoria Mars take the titles in Virginia and Pennsylvania. Eleven women are the richest in their states, including the Mars family and Walton; W.L. Gore & Associates heir Elizabeth Snyder in Delaware; Utah Jazz owner and business leader Gail Miller; New Orleans Saints owner Gayle Benson; Maine billionaire Susan Alfond; Cargill heir Pauline MacMillan Keinath; JAB Holdings heir Andrea Reimann-Ciardelli; CEO Anita Zucker; and Massachusetts is topped by Fidelity Investments CEO Abigail Johnson, who is the ninth-wealthiest female billionaire by net worth in the world. You can check out the full list here, along with a handy map.